Each year 70 million pounds of wool are treated with chlorine to reduce itchiness, shrinkage and pilling. Unfortunately, chlorine leaves behind highly toxic aftereffects. We're committed to safer chemistry. "With chlorine-free wool, there can't be any contamination from conventional chlorine processing. Mills have to halt production and clean the machinery. This can add to the cost of the yarn, which means that chlorine-free wool can be a tough request for our own internal teams as well." Straight from the sheep, wool has small scales that make it scratchy and, when wet, prone to matting, clumping and shrinking. That's why a good portion of modern wool is de-barbed with a chlorine soak that is followed by a coating of polymer resin to smooth any remaining jagged edges. Chlorine is a highly reactive chemical. When mixed into textile wastewater, as well as municipal wastewater, it tends to bond with carbon and create adsorbable organohalogens (AOX), a class of toxins that includes dioxin. Dioxin is known to cause cancer and disrupts the endocrine system in humans and wildlife. Like all AOXs, dioxin is persistent, meaning it does not break down easily in the environment. The mills that process our wool yarns are able to treat wastewater to reduce the amount of AOXs. We want to avoid chlorine entirely and not leave any dangerous toxins in wastewater. FYI: Chlorine treatment of wool is not the only cause of AOXs. Other culprits are vinyl, dry cleaner fluids, household bleach, paper processing and more. Trial and error. Chlorine treatment has been perfected over the last fifty years, and it allows the textile industry to produce washable knits made with very fine yarns. Implementing alternative chemistry requires extensive tweaking and testing to achieve the same results. Quality. For three years all of our chlorine–free wool samples failed our wear tests. These rigorous, third–party tests look at colorfastness, seam strength, shrinkage, pilling and other factors. "Moderate surface fuzzing" is grounds for failure. "We believe in doing our homework," says Julie Rubiner, Facilitating Manager of Knits. "The reason our customers love and trust our core yarns is because we really think about how they live over time." Yarn construction. 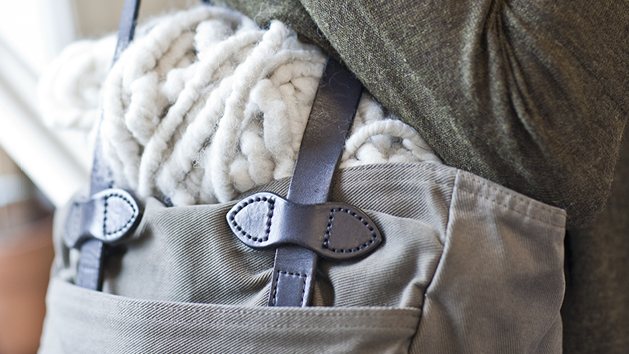 We launched our chlorine–free program with Washable Wool Crepe, a sturdy, high–twist yarn. Washable Wool Crepe requires less chlorine to produce and is inherently more pill resistant than our other Italian merinos. We expect to test alternative chemistry with finer merinos in the coming seasons. Cost and labor. "Asking a mill for chlorine–free processing isn't an easy request," says Shona Quinn, Sustainability Leader. "With chlorine–free wool, there can't be any contamination from conventional chlorine treatment. Mills have to halt production and clean the machinery. This can add to the cost of the yarn, which means that chlorine–free wool can be a tough request for our own internal teams as well." Our VISION2020 commitment calls for a holistic approach to sustainability. For wool, that means improving the chemistry at both the processing and dyehouse level. It also means looking at how sheep are raised and what their impact is on the land. Stay tuned as we update you on our progress. To create a soft, dense surface, boiled and felted wools are immersed in hot water. This process depends on wool's natural tendency to shrink, matte and clump, so the yarns are never treated with chlorine or with polymer resin—an environmental bonus for the felted and boiled wools that are staples in our Fall and Resort collections. Buy chlorine-free paper. Read labels when buying copier paper, diapers, napkins and home tissue products. For the latter, check out NRDC's shoppers guide at www.nrdc.org/land/forests/gtissue.asp. Use chlorine-free bleach and home cleaning products. Learn more at www.ewg.org/guides/cleaners. Find alternatives to conventional dry cleaning. Perchloroethylene ("perc") is a chlorine compound. Hand wash items or take them to an alternative cleaner. The best choice is a wet cleaner. It may be hard to find, but it's worth the search. Wet cleaners use water, biodegradable detergent and special computerized machinery to clean clothes without shrinkage. CO2 cleaning also offers an environmentally responsible alternative to perc. It takes CO2 gas captured as a by-product of existing industrial processes, compresses it into a liquid and uses it for cleaning. What about cleaners that call themselves "green" Or "organic"? Ask about their solvents and chances are they're made with a petroleum-based hydrocarbon. While better than perc, hydrocarbon is a VOC (volatile organic compound) that contributes to greenhouse gasses. For a clear guide to cleaning chemistry and its hazards, check out www.nrdc.org/living/stuff/files/CDB_11052501A.pdf. To find an alternative cleaner near you, go to www.nodryclean.com. Avoid vinyl. PVC—polyvinyl chloride with the recycling symbol 3—is used for shampoo and cooking oil bottles, clear food packaging, school supplies, vinyl siding and plumbing pipes. At the factory stage, PVC creates dioxin; at the end of life, incineration creates more dioxin. Learn more at grist.org/article/umbra-plastics. Support like–minded brands. Patagonia and a limited number of other companies sell chlorine–free wool.